A still image from a YouTube video of an 18-and-under hockey game from Jan. 20 at the Northtown Center between the Cheektowaga Warriors and Amherst Youth Hockey. Roshaun Brown-Hall, left, and Amherst teammates speak with referees at the end of the game. Two players and the assistant coach had been suspended by the team in the wake of the Jan. 20 incident in the Northtown Center in which Roshaun Brown-Hall was called a “monkey” and at least one player on the Cheektowaga team made monkey sounds at him during a game. 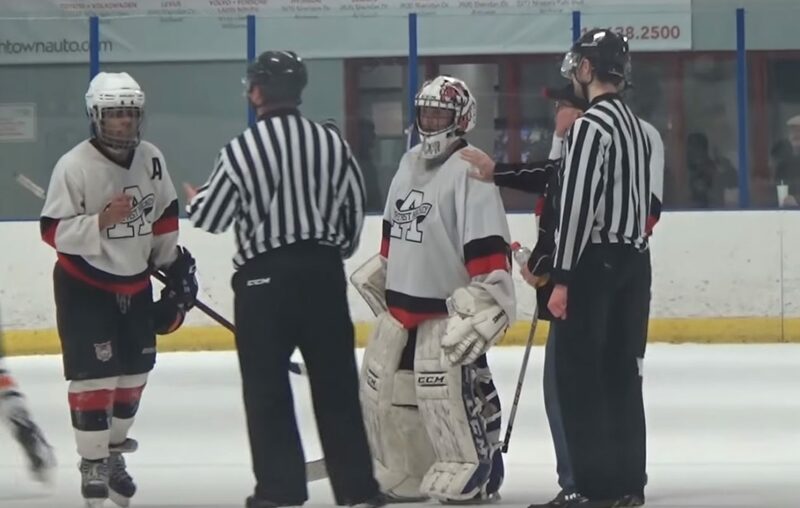 The episode, which was captured on a video posted on YouTube, garnered national attention in mid-March and led to a resignation of a local USA Hockey official.